At the southern-most tip of the USA is beautiful San Diego, California -- my home town and a playground for every water sport from skiing, sailing and surfing to fishing, snorkeling and scuba diving. As a scuba diver you'll find an exciting variety of marine life in Wreck Alley, in various kelp forests and in La Jolla's massive underwater park. The park combines La Jolla Submarine Canyon and Scripps Canyon, an underwater treasure of marine life including some of the more bizarre creatures among us. The valley of this huge canyon system is about 1600 feet down. Its steep walls rise into two branches just made for convenient scuba diving access from the beach at either the La Jolla Cove or La Jolla Shores. At the La Jolla Shores side you can start at the foot of Valicitos Street and swim to the buoys that mark the canyon's upper reaches. Better be pretty skilled at swimming in surf. Otherwise, take a scuba diving charter boat out of Mission Bay. By the time you've descended to about 30 feet you'll be at the Scripps Canyon rim and its precipitous, narrow walls that plunge ever deeper toward the abyss. Be very careful here because the dropoff is nearly vertical at some points, often involving overhanging walls. Visibility is good but variable due to upwellings and occasional strong currents. Winter water temperature is in the 50s; summer water gets up to the high 60s and sometimes low 70s. Scuba divers and scientists alike have made the La Jolla and Scripps Canyons one of the most-studied undersea environments in the world. You can see the prestigious Scripps Institution of Oceanography and pier from any point along the La Jolla coastline. La Jolla Canyon's fan valley was the site of the world's first deep oceanic drillings, where core samples were retrieved from thousands of feet below the sea floor in 1961. 15 minutes south of La Jolla is Wreck Alley, about a mile off Mission Beach. Here you can explore artificial reefs created by eight sunken ships and a couple of unlikely structures that got there by both accident and intent. The latest addition is the 366-foot Canadian destroyer Yukon, which was intentionally sunk here in about 100 feet of water during the year 2000. The Yukon still has years to go before it can compete with its older companions as a showpiece of densely populated cover. The Ruby E, a 170-foot Coast Guard cutter resting in about 70 feet of water, was covered bow to stern with brilliantly colored Corynactis Californica anemones only a few years ago. But being one of the most beautiful sights for scuba divers' eyes brought so much scuba diving traffic that some of the life has disappeared. Yet you can still drift through the wheelhouse and be absolutely dazzled by thick growths in a stunning array of colors. Be sure to bring a light. Then there's the kelp cutter Del Rey and several smaller wrecks, all with much more growth than the others because of lighter scuba diving traffic. Now if you want to feel like you're on an underwater highway, be sure to visit the Ingraham Street Bridge at about 60 feet down. It was demolished and dumped here in the '50s or '60s to make way for a new bridge in Mission Bay Aquatic Park. Now with some 50 years of cover it has become more like a natural reef with abundant growths of kelp, fans and algae, great colonies of filter feeders and all the marine life that comes to nibble. Finally, there's NOSC Tower, thanks to a 20-foot wave that dealt a fatal blow in the dark of one 1988 winter night. For three decades the NOSC Tower had served as a research platform off Mission Beach for the Naval Electronics Lab and the Naval Ocean Systems Center. Now it's a twisted mass of steel covered with anemones, mussels and star for fabulous scuba diving in a world of stunning color. Bring a light for the show and a sharp knife for the fishing line and rope that you're likely to find. Bring your camera too, of course, for a great photography dive. Visibility averages 15-25 feet and by the way, hunting is not wanted here. You can reach this great scuba location on such Mission Bay charter boats as Blue Escape (619-223-3483), Dive Connection (619-523-9282) and DiveQuest (800-303-3483). Copyright MBPCO 2006 and Beyond. Elizabeth Miller is an author/publisher. 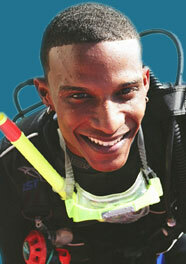 For more on scuba diving just drift on over to scuba diving.